Skillshares, talks, family activities, a swapshop and cafe! 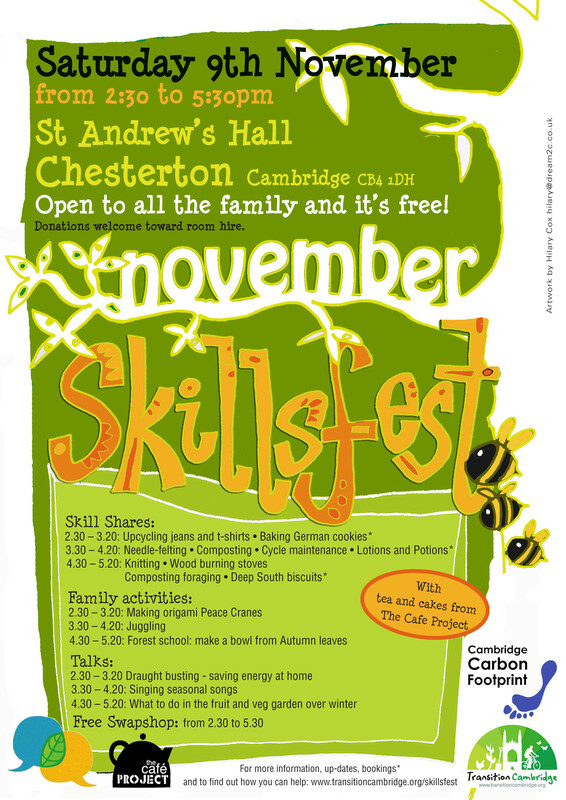 Organised in collaboration with Cambridge Carbon Footprint, Greeniversity and The Cafe Project. Cost: Free, donations towards room hire very welcome! Poster: If you are able to put up a poster in your work place or street, you can download it here (or here it is as a jpg, in case the pdf gets scrambled). Thanks! Please note you will need to book for the following activities here: German Christmas cookies; Lotions and Potions; and Deep South Biscuit. Full details about all talks, skillshares and activities below. Baking German Christmas Cookies 2:30-3:30, Kitchen Axel Minet will teach us how to make some delicious German Christmas cookies. Composting and compost foraging 3:30-4:30, Hall Area D followed by outdoor foraging if weather allows Composting is a great way to add fertility to your soil in the garden or allotment. This interactive session will include easy-to-remember tips and tricks, what to avoid and remedies for times when it goes wrong. There will be plenty of opportunity for questions. Cycle maintenance - learn how to fix your bike 3:30-4:30, outdoors if weather permits, else inside Learn how to maintain your bike in good condition and fix simple things like flat tyres - Andy will be able to offer advice on other problems too. Led by Andy Rankin, who once cycled to Turkey so is a dab hand at fixing things on the go. Deep South Biscuit 4:30-5:30, Kitchen American 'Deep South' Biscuits are a savoury favourite for any time of day and can be likened to a light and airy scone. Great with fried chicken, smothered with gravy, or just eaten by itself with jam and butter. This skill-share will be taught by Ben Kidder, who's originally from New Orleans in Louisiana, USA. Knitting - a couple of twigs and some strings 4:30-5:30, Hall Area C Fancy a chunky cowl for this winter, or another lovely knitted garment? Why not learn the craft and knit it yourself! In this session, we'll cover knits, purls, cast-on and cast-off - and that's most of what you will need to kick-off your knitting project. Books will also be on display so you can browse through inspiring pattern ideas. Lotions and Potions - making creams and balms 3:30-4:30, Kitchen Learn how to make your own hand creams, lip balms and other skin products using simple ingredients such as olive oil, beeswax and essential oils (i.e. no artificial ingredients). These make great Christmas presents! Led by Dave Jackson, Alana Sinclair and Joss Cutler. Needle-felting 3:30-4:30, Hall Area C Needle felting is a way to create felt from wool without the use of water (i.e. this is not 'wet felting'). The needle has tiny 'hooks' in it to matt the wool. Great for making flower brooches, wall hangings or Christmas decorations. This workshop is led by Elizabeth Harrington, who made these brooches. Upcycling T-shirts and jeans: Top Tips for old Ts 2:30-3:30, Hall Area C Do you have old T shirts, jeans or trousers that a charity shop would struggle to sell, but are too good for the textile bank? Bring them along to this interactive workshop and share ideas of how to create useful and lovely things from harvested fabric. Try out a couple of simple techniques, and browse books and projects-in-progress for more inspiration. No need to book. Wood-burning stoves and other forms of renewable energy for the home 4:30-5:30, Hall Area D Nicola Terry from the Transition Cambridge Energy Group will give an introduction to wood-burning stoves, including what you need to know if you are thinking of installing one. She will also be able to answer our questions on other forms of renewable energy for the home. Draughtbusting and other ways to save energy at home 2:30, Meeting Room 2 (upstairs) Tom Bragg from Cambridge Carbon Footprint will take us through various practical ways that we can save energy at home, from draught-proofing doors and letter boxes, reducing heat loss from windows, reflecting heat back in from walls behind radiators, and a multitude of other energy reducing measures. He'll bring some sample of materials for us to have a look at, and will shows some videos of DIY installations. Singing Seasonal Songs 3:30, Meeting Room 2 (upstairs) Bev Sedley will teach us some simple songs from around the world - come along if you love singing or if you've never sung in your life - all are welcome! Grow your own 4:30, Meeting Room 2 (upstairs) Find out how to grow your own vegetables with experienced allotmenter Dave Fox, who runs regular Grow your own sessions on his allotment in Trumpington. Origami peace cranes 2:30-3:30, Hall Area B This is a lovely fun activity for all the family, and a great way of way recycling old paper to make this international symbol for peace. It will be lead by Joy Magezis. All ages are welcome to take part, children should be accompanied by adults. Learn to juggle! 3:30-4:30, Hall Area B Daniel Weiss will teach us how to juggle - all welcome, whether you've never tried to juggle before, or you feel ready to learn some tricks, or even to try juggling more than 3 balls (Daniel can juggle at least 5!). Forest School: Making a bowl from Autumn leaves 4:30-5:30, Hall Area B Celebrate the Autumn season by learning how to make a leaf bowl from nature's offerings. It would be helpful if you could bring 2 bowls of the same shape and size, and a bag or box to take your leaf bowl home in. All other materials provided. There will be other Forest School activities for you to try too. This will be led by Julie-Ann Roscowski, who has just completed her training as a forest school teacher. All ages welcome, children should be accompanied by parents. There'll be a space for a swapshop (aka free shop) - the idea is that you either bring things to give away, take things that you can use, or both i.e. no direct swapping required, it's more a "bring and/or take"! Please only bring things in good condition, and bring your own bags to take things home in! We're going to need lots of help! Here are some specific things we're looking for help with, but if you could just help out generally with whatever needs doing, that will also be appreciated - just come along. help putting up posters round town/libraries/workplaces etc - we will have lots if you'd rather not print one out (a bit heavy on the green ink!). Hall A Cafe Tea and cakes cont.